Place eggs, garlic clove, onion, two tablespoons of flour, tablespoon of parsley and salt in the blender and mix for 2 minutes. Place the mixture in a bowl. The bread crumbs should be placed in a bowl. Dip both sides of each breast in egg mixture; immediately coat each with the bread crumbs. Cook oil in skillet over high heat once hot before add the breasts, carefully in pairs or according to the size of the skillet. You should cook the breast for 10 minutes on each side and use a fork to check if the chicken is tender; no longer pink inside (and a temperature in thickest part 165°F). Otherwise lower the heat and let the breasts cook for 3 minutes per side. Immediately serve and garnish the breasts. They go well with French fries, lemon and salad. If you’d rather bake the breasts, you should first spray the baking sheet with canola oil and immediately place the breaded breasts on it. Bake for 40 minutes at 350°, remember to check internal temperature of chicken breast. You can add cheese and baby tomatoes with basil over the breasts for garnish. 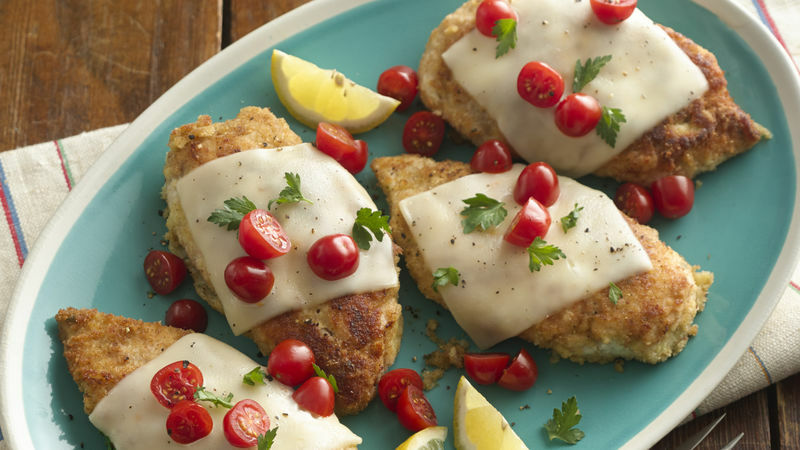 Serve the chicken milanese as soon as it’s out of the oven or skillet, before it loses its texture and flavor. Even though this recipe is easy to prepare, it reminds me of special dinners with one or even several guests. It’s one of those dishes that, if served with elegance, makes you look like a genius. Chicken milanese is a popular favorite. Though the traditional milanese is sautéed in oil, you should know that it may also be cooked in the oven. It’s a better option with probably fewer calories. I believe breading chicken is much like applying makeup. We start off with a simple chicken breast and turn it into a succulent and attractive filet. The golden color of the breaded chicken also makes it stand out. Your guests will be sure to ask for your recipe. You will see for yourself. Chicken milanese is no doubt a delicious recipe, perfect for all kinds of lunches, dinners or special get-togethers.